Some of his old tweets are tasteless. 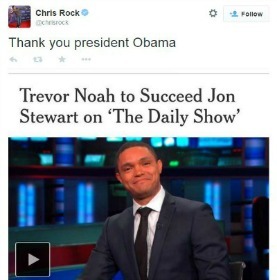 When it was announced yesterday that Trevor Noah would be taking Jon Stewart’s spot behind the anchor desk at The Daily Show, many were surprised. There are rumors (h/t Jezebel) that Amy Poehler, Louis CK and Amy Schumer were approached for the job and all turned it down. So with the surprise selection, everyone raced to the internet to learn more about the 31-year-old South African comic who would be bringing them the real/fake news every night. And what some people have found has got them fired up. And not in a good way. As a result, there are some people calling for his dismissal before he can even debut. He does have his supporters, who are reminding people that he’s a comedian who may have told a few bad/off-color jokes and digging back in his Twitter feed might not be the best measure of him. “Though Mr. Noah has performed stand-up comedy around the world, he is not well-known in the United States, and he has appeared as an on-air correspondent on The Daily Show only three times before being promoted to host,” notes The New York Times. And herein lies the problem. He’s an unknown entity stepping into the big and beloved shoes of Jon Stewart, someone who has been invited into people’s homes for 16 happy years. Not only are fans curious about who Trevor Noah is, they have a personal investment in making sure it’s someone who isn’t going to get in the hot seat and stink up the whole place. But because he’s largely unknown, viewers are going to draw conclusions about who and what he is based on what they find on the internet, a place where things live on forever. And when you’re talking about comedy, where some jokes walk the fine line between good and bad taste, you need to have a good hype man to get things started. Part of Comedy Central’s job in introducing him is showing us what it is they see in him. A couple of tweets and a new articles won’t be enough for that. Some sort of early morning or late night appearance to accompany the announcement probably would’ve been a good idea. We wouldn’t be surprised if that’s in the works now so he can answer for these old crappy jokes. The last thing Comedy Central or Noah wants is to get started on the wrong foot.